a mill, esp one equipped with large grinding stones for grinding grain. This is one of the most memorable trips to date; a day of fun and adventure for us all. Both of these mills were absolutely gorgeous and to see them work like how they did over 100 years ago was mind-blowing. As we pulled up onto the property of Schech’s Mill, we were struck by the beauty of the buildings and scenery surrounding it. Edward came out to greet us with his welcoming demeanor and ushered us inside the old mill. He gave us a tour of the facility, showed us how the equipment worked and shared its amazing history. Power for the mill came from three Leffel turbines and one Sampson turbine. The equipment included four run of 22” Diamond buhrstones, a roller mill, crusher, sheller, bolters, and related elevators. Again, the powerful force that sent the machinery into motion caused a rumbling of the building was felt deep in our bones. What an honor to be able to step inside and see exactly how the gristmill worked its magic. Most of the original equipment is still in use including the original millstone imported from France. A lot of history to grasp, certainly not enough for one trip; Dan and I will be planning to return in the near future. I recently used all of the Corn Meal on delicous homemade Corn Bread but I still have the wheat flour made from this mill today. Tasty, tasty, tasty!! With appreciation, I thank you Edward, for sharing a little part of history with us on that day. In 1876, John Blinn built a mill in one of the beautiful valleys of southeastern Minnesota. An article in an 1887 mill paper brought the mill to the attention of Michael Schech, a master miller who had immigrated from Bavaria and was employed at one of the large mills in Minneapolis. Schech purchased the mill which was operated by Schech’s brother until 1890 when Michael Schech relocated their family to their Beaver Creek Valley home in Houston County. The mill became known as Schech’s Mill. When Michael retired in 1913, Edward took over the operation. 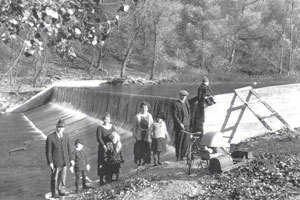 In 1922, a concrete dam replaced the old wooden one and two years later a concrete water wheel pit was constructed. After Edward’s death in 1941, his wife continued operating the mill for the next five years. In 1946, Edward’s daughter, Eleanor, and her husband Ivan took over all mill operations. Eleanor and Ivan’s son Edward began helping with operations in 1960. “Every September their son Edward would come over and help clean the mud from the turbine pit”, said Ivan.